One of the milestones you look forward to as a mother of a daughter is the day that she will “Say yes to the dress”. Just the same, I’m pretty sure this is a moment that every little girl also dreams of. With the reality TV show that has become so widely popular, I feel like our expectations for this occasion have been heightened even more. We’ve all watched the moment that the bride falls in love with THE dress and all the emotions that erupt thereafter. We’ve also watched some very awkward moments where a family member or friend of the bride speaks out of line, or gives too many opinions. 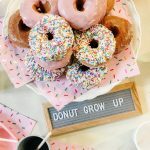 Just a few weeks ago, our girl said yes when her now fiance popped the question. With a fairly quick turn around on their wedding date, there was no time to waste on getting a move on all the wedding plans. She organized for her sister and I along with a few of her close friends to go wedding dress shopping in Victoria, B.C. where she lives. I was so excited to embark on this exciting adventure with her! I didn’t have much prior experience in choosing a wedding dress. I remembered back to when I got married 20 years ago, and realized I had literally just walked into a bridal shop one day with a girlfriend, tried on a few dresses and bought a dress. My mom wasn’t there or anything. Looking back I feel bad for leaving her out of that special moment. Oh the things you realize as you get older. All that to say, I was honoured that my daughter invited me to be part of this special day! Even more special is that she allowed my mom (grandma) to come as well. 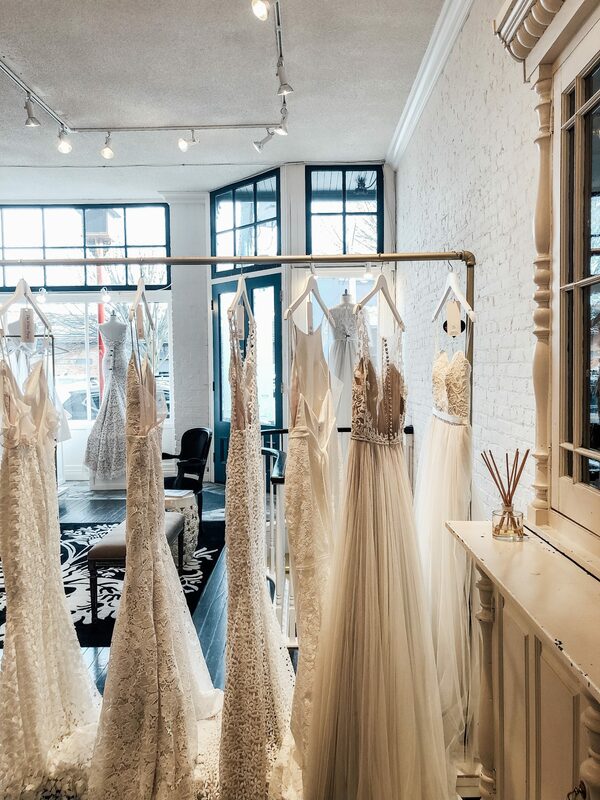 My daughter had organized appointments at 3 different bridal boutiques in Victoria. I asked her before we started whether she had a specific dress style in mind. Although she had a couple photos on her phone, she was going into the experience very open minded. I was proud of her for that. She wanted to find a dress that she was comfortable in and that was her only expectation. The first stop felt like a great success. She tried on about 15 different gowns and a few times we thought for sure she had found “the one”. Its funny how you can just tell by a girls face when that curtain opens. The curtain opened on this one particular dress, and I could see it all over her face. Her eyes lit up and she said “I really like this one”. It was stunning and she was beaming in it. She walked around the store in the dress and I could just tell that this dress was definitely going to be hard to beat. 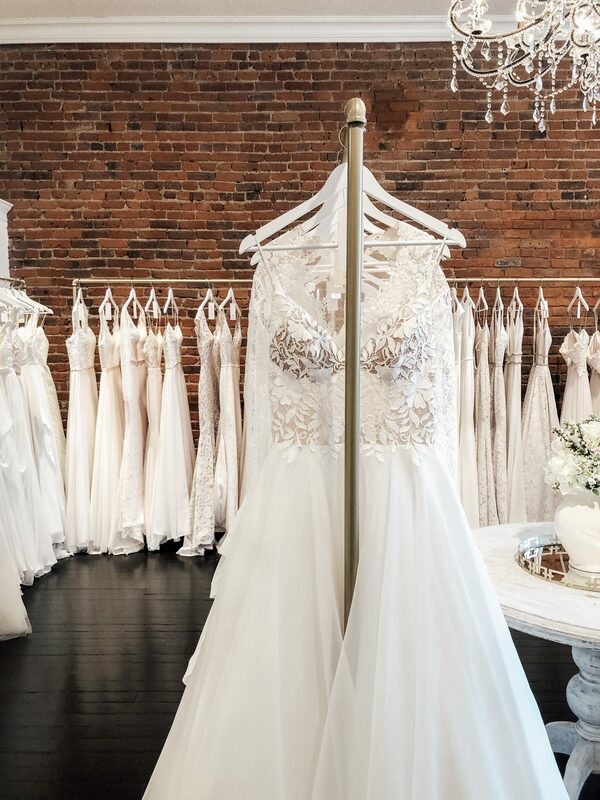 I think we all felt like this was the dress but knowing we had other appointments booked, we thought we would be wise to at least check out the other boutiques. We knew this dress was available in the event nothing else compared. 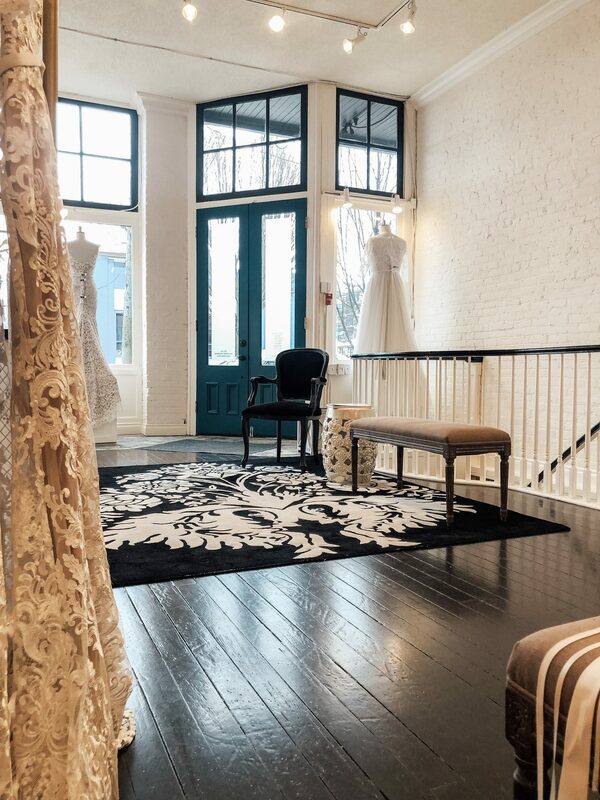 We left that first boutique feeling pretty confident that we’d found the dress but still open minded. Our appointment at The White Peony was supposed to be our last appointment of the day. Having some time to spare we decided that we’d stop there before our next appointment and see if we might be able to just browse the racks. 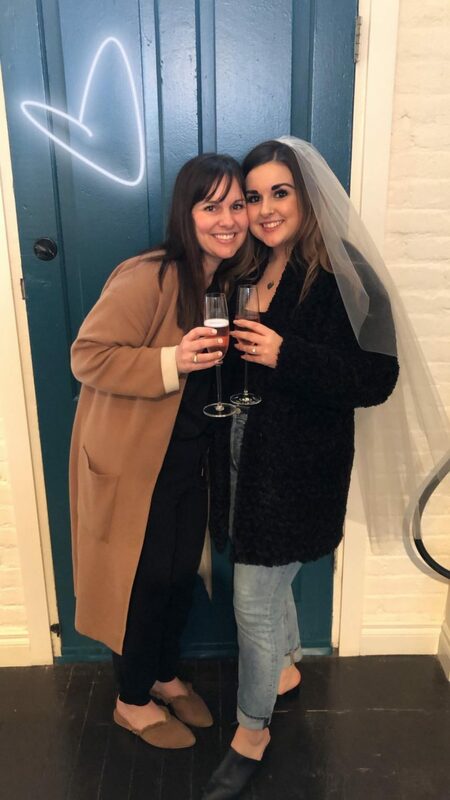 We were honestly feeling so confident about the dress from the other boutique that we thought we might end up even cancelling the other appointments. We walked into The White Peony and asked if we could just browse the racks. Much to our surprise, they had a cancellation and were able to get us right in! 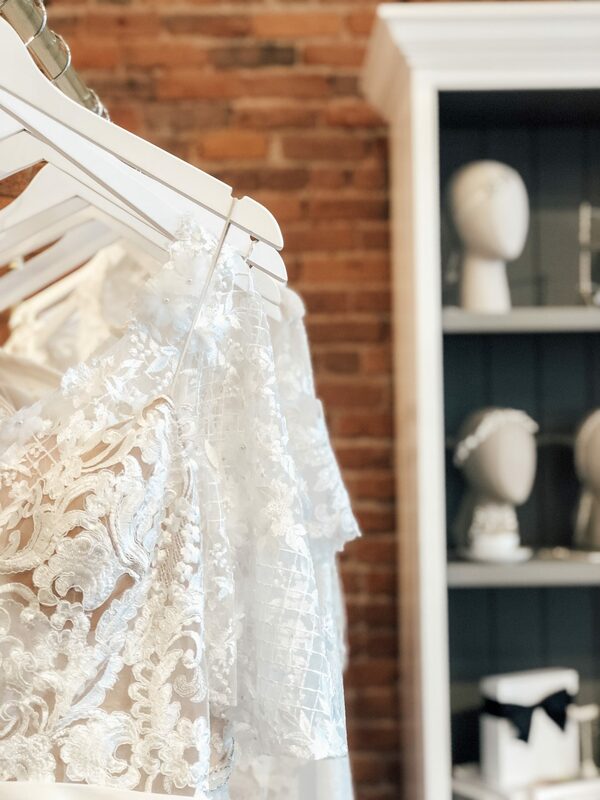 Walking into this intimate bridal boutique already felt like a completely different experience. The first boutique was lovely, but this one was just next level. The staff greeted us and made us feel like we were walking into their home. We felt like welcome guests to their intimate little setting. Right away we started looking at dresses and inside I already wanted to find a dress here simply for the experience. Its the little details right? Those little extra measures that a business takes to make your experience special. They set us up in the most quintessential private sitting area with a large antique mirror. The brides fitting room was just as pretty and spacious allowing plenty of room for her to try on the gowns and then come out to show us. Its hard to explain, but the whole setting was just a step above. 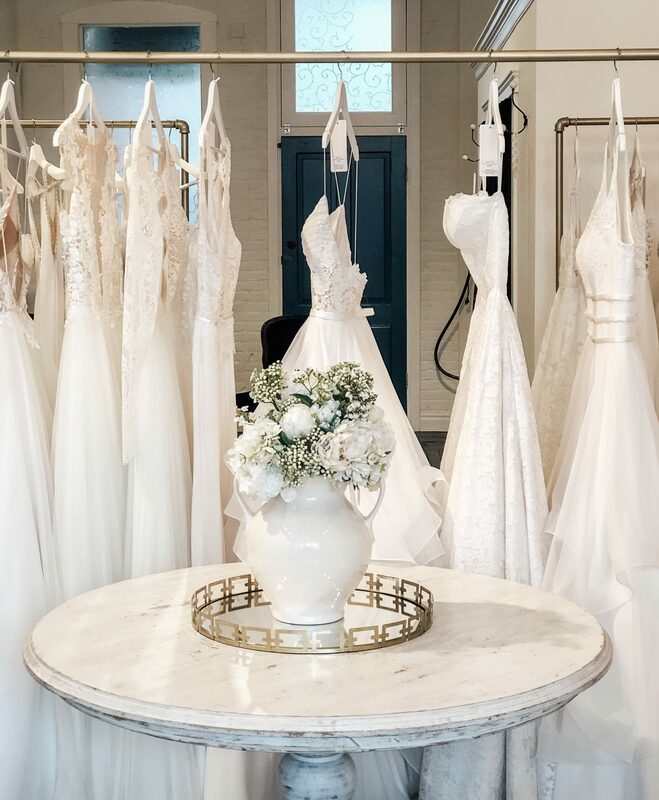 The lovely staff at The White Peony helped us choose some beautiful gowns to try on, and we chose a few ourselves as well. Tianna started trying on dresses and we were eliminating options and having fun seeing the different styles. There was a moment that she opened the curtain and exclaimed “I really like this one” . It was a beauty! The dress fit her perfectly, and was a real contender against that first dress. This next part is where the whole story comes together:) . There was one last dress to try on. Tianna was already in the fitting room and we all looked at this dress and realized that it looked almost identical to dress from the first boutique. I didn’t think it could possibly be the exact same one, so I pulled out my camera and brought up the photos we had taken of the first dress. 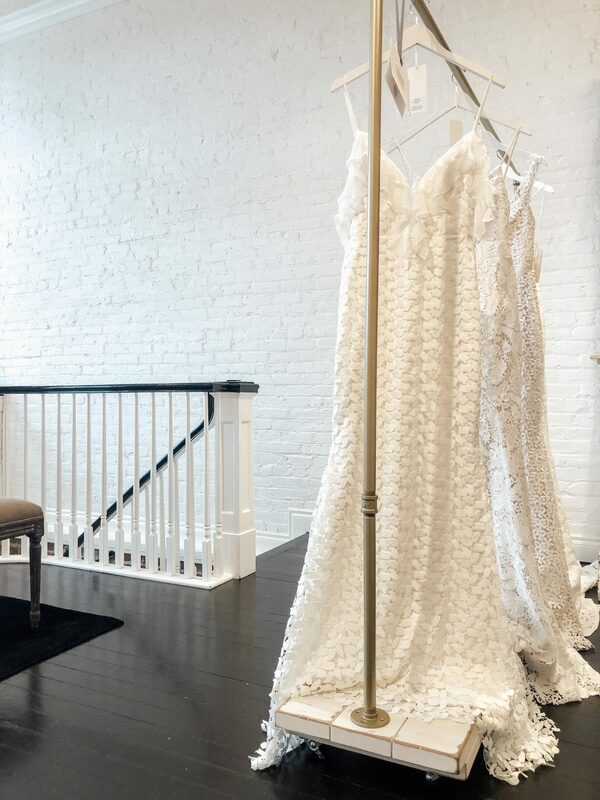 I had one of the staff compare with me and she confirmed that it WAS the exact same dress she had fallen in love with at the first boutique. They handed Tianna the dress to try on and immediately she realized it was that dress. We thought, ok, this will be a very good test on whether its “THE” dress. Well, it was pretty clear within minutes. She opened the curtain and squealed, “THIS IS MY DRESS!” Her face was glowing and there was no doubt! She decided to once again take a little walk around the boutique in the dress and kept declaring, “this is my dress, this is my dress” . 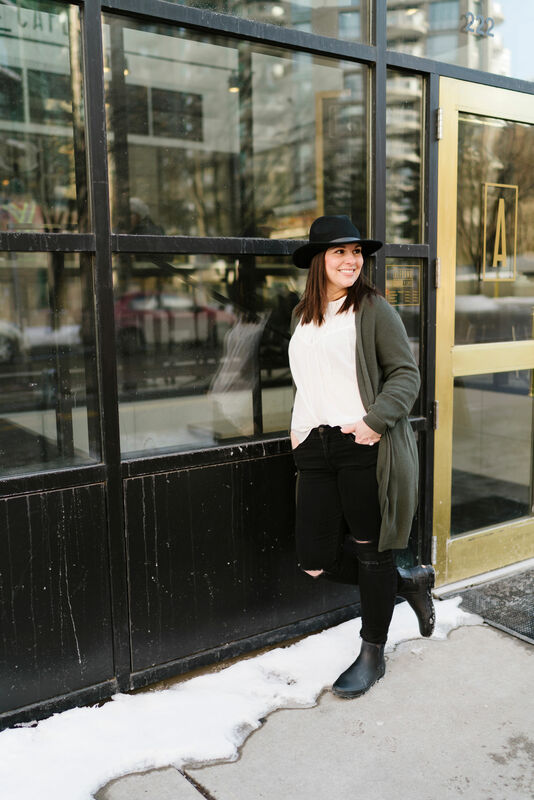 So, naturally we asked her the big question – “Are you saying yes to the dress? ?” and without a doubt she said “YES”. There were tears, hugs, and all the emotions you would expect. The staff were so sweet, and excitedly said “Should we pop the champagne? ?” Just another extra little touch they had all set up to make this moment feel special. We were able to sit for quite while, not feeling the least bit rushed. We chatted, enjoyed out champagne, took photos and just soaked in the moment. The staff were patient, gracious and never once made us feel like a burden. 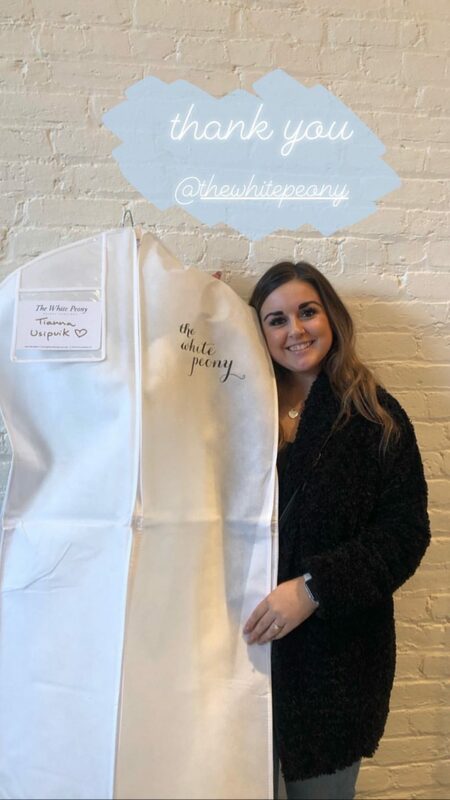 If you are located anywhere near Victoria, British Columbia and have a bride to be in your life, I HIGHLY recommend the experience you will have at The White Peony. 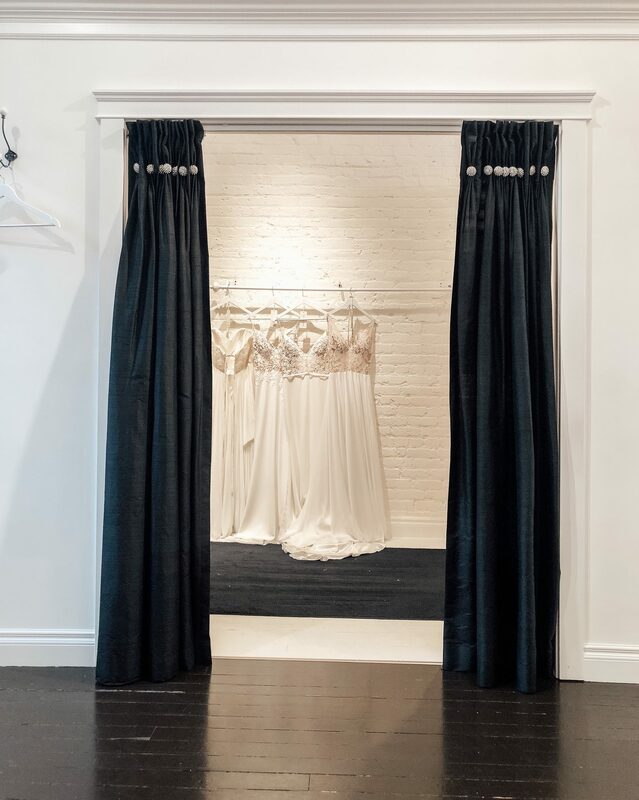 Every bride deserves to “say yes to the dress” in such an intimate and special way. Thank you to the staff of this lovely boutique for making our special moment so memorable.